Make up : Buddhadasa Galappaththi. Opera "Sondura Warnadaasi", by the veteran musician Premasiri Khemadasa, has been presented recently at the Lionel Wendt Theatre. "Sondura Warnadaasi" is based on an interpretation of 'Kanawera Jathaka' where Warnadaasi, the leading courtesan of the city falls in love with a leader of dacoits. The dacoit leader is no other than Bosath, the Buddha in a one of his births. 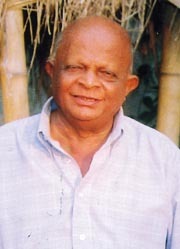 Khemadasa has created music for films, theatre and teledramas in different styles and remarkable rhythms for over four decades. He made a unique contribution to the local music as he gifted two operas (Manasa Wila and Doramadala) and one cantata (Pirinivan Mangalyaya). Opera "Sondura Warnadaasi", no doubt will be another creative explosion. This Jathaka story has every component of an opera, Khemadasa says, explaining why he specially selected it. "Besides, it has a contemporary value and is true even today." Eastern raagas synchronised with Western harmonies produce scintillating music in this opera. such as operas and cantata should be created if we are to improve local music. There is a discerning audience for music." The opera was presented by a team of students from the School of Performing Arts - Khemadasa Foundation. Source : "Daily News", 26 January 2002. If there is one recent Sri Lankan CD that has not received the accolades it deserves, it is Pradeep Ratnayake's Indrakeelaya (The Unshaken), more than one hour of fascinating sitar fusions connecting a myriad musical traditions from both within Sri Lanka and the West. For those who appreciate the unshackled creativity of sitar fusion, this is the CD they have been waiting for. 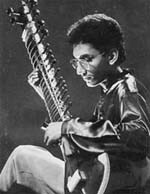 In the five pieces in the CD, performed in the several Pradeepanjali concerts held during the past few years, Pradeep revokes his brilliance both in composition and performance. Indrakeelaya brings together not only the various musical styles, but the diversity of musical talents available in Sri Lanka both in the Eastern and Western music scenes. It is a mix of traditional sitar ragas, folk strains, religious hymns, jazz improvisations, rock renditions and many more in the tradition of world. All the music has been composed by Pradeep himself. The main piece in the CD, Indrakeelaya was composed to commemorate the Golden Jubilee of the Central Bank building, a symbol of the ethnic conflict. The Central Bank building was destroyed by an LTTE bomb blast in the nineties, and its reconstruction became the epitome of hope and finally for peace in the island. The very meaning of Indrakeelaya itself - 'The Unshaken' - refers to an unshakable post or column with divine powers in Buddhist and Hindu systems of beliefs, usually placed at the entrance of cities or important buildings.